Hi everyone. It has been a little while since my last post. Firstly, I want to talk a little about Irene. I am sorry that I stopped updating during the storm, but I lost power for nearly 72 hours. I did have a generator, but my internet and cable was out for the whole time. By the time we got our power back Tuesday night, Irene was long gone and finished. What she left behind was devastating to the Northeastern United States. 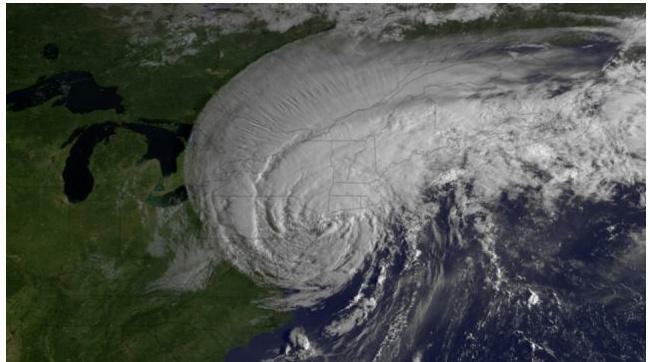 Irene caused billions of dollars in damage and nearly fifty deaths. In the Philadelphia area, millions of people were without power and many trees were down. New Jersey was hit the hardest, as widespread flooding and downed trees shut down most of the state. We will likely not see a storm like this for a long time. Irene will no doubt be remembered for generations to come. Now, for the current situation. Katia is presently a category 2 hurricane. She shouldn’t be any threat to land other than some high surf at the Jersey shore. 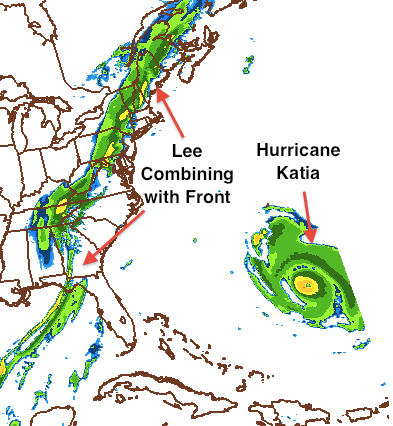 Lee, on the other hand, will combine with a cold front and create a swath of moisture extending from the Gulf of Mexico to Canada. In our area, I would expect 2-3 inches of rain to fall by Tuesday night with locally higher totals. A Flood Watch is in effect until Tuesday night. The weather should clear up by late week as high temperatures will fall into the 70s.